The Hollywood Reporter has obtained months of correspondence between Digicon Media, who holds a copyright on "Virtual Marilyn" and plans to project her singing and dancing alongside a live ensemble of music stars, and the estate of the deceased blonde bombshell, which plans to take legal action should such a production take shape. "Virtual Marilyn" is said to use the same technology that was responsible for Hologram Tupan Shakur—known around these parts as Holopac—who was not really a hologram so much as a digital resurrection of the deceased artist. But intellectual property, and rights to celebrity and identity in particular, can make a dead star's digital debut tricky to pull off from a legal perspective. In this case, Paul Bost, an attorney at Sheppard Mullin who is representing the Monroe estate, is contesting Digicon's legal right to Marilyn's image—even if it distinguishable from the actual Ms. Monroe. In December, Digicon received a cease-and-desist letter from the estate that claimed that "Virtual Marilyn" infringed upon its intellectual property and demanded a stop to the use of any marks, names, logos and designs that were based upon the identity and persona of Marilyn Monroe. The digital studio insists that it has done something unprecedented-copyrighted a human persona-and that the statute of limitations has passed on any possible legal objection since the estate knew about what has been in development for more than fifteen years. The digital persona is also said to be completely distinguishable from the woman who died in 1962 of an apparent drug overdose. Bost, on behalf of the estate, refuted the possibility that the statute of limitations had passed. In reference to the Google videos of "Virtual Marilyn," he wrote that they all appear to date from the mid-1990s, and that if "Virtual Marilyn" had some life back then, it was "limited and short-lived" and not very successful. He says there is "no evidence" that the Monroe estate was aware of the activity, and he tells a Digicon official, "You appear to want to resurrect Virtual Marilyn after 15+ years of non-use." Bost reiterates the demand to stop exploiting Monroe's persona. The reference is to court rulings in cases where Monroe's estate sought to assert violations of Monroe's personality rights against photographers who licensed for such products as T-shirts. The cases were unsuccessful because it was determined that Monroe lived in New York at the time of her death and the state doesn't have generous publicity rights for celebrities. "Monroe could not devise by will a property right she did not own at the time of her death in 1962," a judge ruled. The January letter from Digicon to the estate's attorney continues, THR reports, "The Estate is now Judicially Stopped from claiming ANY Privacy, Publicity or related rights to name, image or likeness obtained through testamentary inheritance in New York." 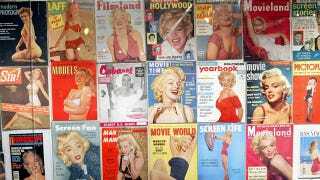 In February, Bost responded and indicates that a lawsuit likely would be premised on alleged trademark violations for causing consumer confusion and implying an endorsement or or association with Marilyn Monroe. "Ms. Monroe was famously known as a model and actress during her lifetime," he writes. "You are wholly re-creating Ms. Monroe to serve as a model and actress." "The Estate of Marilyn Monroe is the sole and exclusive holder of Marilyn Monroe's personality and identity rights and rights in the MARILYN MONROE trademark, and the unauthorized use of Ms. Monroe's identity and persona, such as that contemplated by Digicon Media, violates and infringes the Estate's rights in derogation of several Federal and State laws. New and emerging digital and holographic technologies present the Estate and Authentic Brands Group with a host of intriguing opportunities befitting an icon of Ms. Monroe's caliber. To that end, the Estate and Authentic Brands Group look forward to teaming with best-in-class partners in these fields to bring Ms. Monroe's fans top-of-the-line, exciting entertainment experiences. The Estate is unfamiliar with Digicon Media's capabilities as a developer and producer of digital and holographic technology, and is unaware of any successful attempt by Digicon to organize any meaningful exploitation of the crudely animated character that it claims to be a representation of Ms. Monroe and which it allegedly created in the mid-1990s. The Estate and Authentic Brands believe that the technological advancements made since that decade allow talented developers to create superior virtual characters, akin to the virtual Marilyn Monroe character portrayed in Dior's popular ad campaign for its J'Adore perfume. The Estate's cooperation is required if anyone intends to market and exploit Ms. Monroe's identity and persona through a "live" concert or otherwise, and Digicon has not secured any such cooperation from the Estate to date."